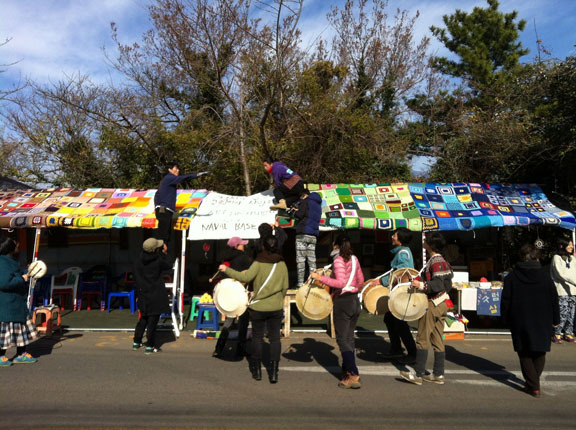 Gangjeong villagers and activists decorate the streets with colorful woolen squares knitted by supporters of the anti-base struggle. Traditional drummers play in the foreground. I recently spoke with two members of Veterans for Peace, who had become involved with Korea issues in only the past few years. Each of them came to know Korea through their support for the Gangjeong villagers who have been battling, for nearly eight years straight, construction of a huge, high-tech navy base being built on their Jeju-Island coastline. Both men said that before Jeju, their work with northeast Asia was Japan-centered, and that “no one ever talked about Korea.” But through their engagement with Gangjeong, they have learned about the April 3 massacre, about the unending Korean War, about the unprecedented tonnage of bombs that the U.S. levied upon the Korean people in the early 1950s, and about modern Korean history, in general. Today, they recognize that the Korean War was certainly as consequential in U.S. history as the war in Vietnam. It now perplexes them that Korea had been effectively erased from the books. The sad truth is, the vast majority of even the most progressive Americans know very little about Korea, let alone that the U.S. has been at war with it for the past 60 years. Many don’t even know where Korea is. This absurd knowledge void presents a challenge so daunting for those working toward unification, that nothing short of alchemy would seem to hold any promise for peace on the peninsula. On the other hand, it appears that the tragedy unfolding at Gangjeong village might offer just the sort of alchemy that could conjure Korea into the wider consciousness. Ecumenical groups, environmental groups, artists, lawyers, social workers, peace-studies groups, student groups, indigenous-rights groups, and food-sovereignty groups have all passed through the tiny village whose fame is now of global proportion. Numerous articles on the villagers’ plight have been published in Europe, South America, the Asia-Pacific and the U.S. Last summer, I was at the San Francisco airport with Gangjeong’s charismatic Mayor Kang Dong-kyun on his first foray outside of northeast Asia, when a woman behind him in line said, “Aren’t you Mayor Kang? From Gangjeong village?” It turned out she had studied Gangjeong as part of a peace-studies program in Virginia, and recognized him from internet videos. Little Gangjeong has put Korea “on the map” and affirms that the Korean War is indeed alive and well. 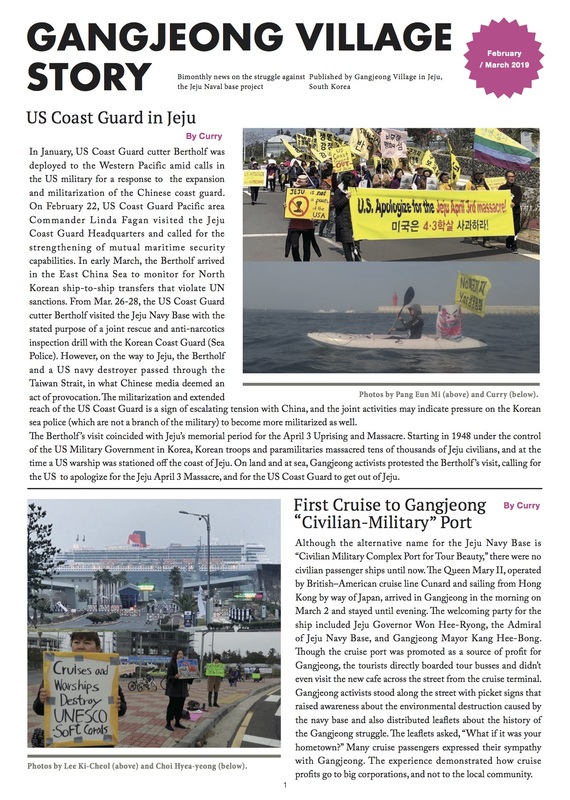 Then, in fall of 2013, the City of Berkeley, California, was the first city in the world to formally declare its support of the Gangjeong villagers in the form of a resolution opposing the navy base. Shortly thereafter, in Madison, Wisconsin, the National Board of Veterans for Peace passed a similar resolution to “Stop the Second U.S. Assault on Jeju Island.” The document not only describes what is at stake if the base project is allowed to proceed, but also gives historical context, such as the 1948 genocide on Jeju and how the ever-increasing militarization of Korea violates the 1953 Armistice. It reads like an overview of modern Korean history vis a vis the United States. The global draw of the Gangjeong village struggle owes much to the fact that the land, water, heritage and culture at stake have already garnered international recognition. Gangjeong’s culture and environment have earned UNESCO designations. It is one of Korea’s few remaining traditional, indigenous villages; it contains some of Korea’s best farms and richest soil, its purest water and its haenyo diver tradition; its coast was home to Korea’s only pod of dolphins and one of the world’s finest, soft-coral forests (now being dredged); and its 1,900 residents practice authentic local democracy. True, all these elements attract an international crowd. But the most enduring appeal of the humble village sits squarely in its remarkable community spirit. The community is comprised of an eclectic mix of villagers, clergy and Seoul activists, who strategize and carry out campaign after campaign. There are cooks, videographers, and kayakers who monitor environmental violations by construction crews. There are people setting up for “Hundred Bows” every morning, or for a music concert in the evening. There are people manning the Peace Center, ready to welcome new arrivals disembarked off the public bus steps away. There are people printing up information pamphlets to disseminate at any one of the big, international conventions that regularly take place on Jeju. It is no exaggeration to say that the village is as fueled on dynamic love as it is by donation. Most recently, there have been scores of knitters – yes, knitters! – sitting crosslegged in the Peace Center for hours at a time, lashing together enormous woolen quilts in rainbow hues, out of over a thousand knitted squares sent to them by supporters from all over Korea. December 2013 in Gangjeong saw the streets festooned with the quilts, and even the skeletal trees were given cheery, colorful “sweaters” that fit snugly over their trunks and branches. The sight of this whimsical riot of color splashed across winter’s dreary landscape, in contrast with the phalanxes of stern and smooth-faced cops who robotically pull away every protestor from blocking cement trucks, is indeed chilling — yet somehow, transcendent. Even an atheist once commented that life in Gangjeong was the closest one could come to living with God. Maybe that’s why, when visitors return to their own countries, either voluntarily or through deportation, they are compelled, almost evangelically, to “spread the word” through events, writing articles, and making films. Something special is going on in Gangjeong. But it wasn’t always this way. Initially, the villagers were highly suspicious of outsiders, particularly those from the Korean mainland. They carried the trauma of the April 3, 1948 massacre in living memory, when the South Korean army, under U.S. orders, unleashed wholesale terror on the island and murdered at least a third of the population. Understandably, the South Korean government’s announcement that their village would be the site for a navy base only reinforced their mistrust of outsiders. In those beginning years, the Gangjeong villagers battled alone, in total obscurity. But at a certain point, with everything at stake, they had no choice but to embrace the support of mainlanders who seemed authentically sincere. One such mainlander was artist Sung-hee Choi, board member of the Global Network Against Weapons and Nuclear Power in Space and the pivotal person in exposing the struggle internationally. She started a blog, No base stories of Korea, in December 2008 which first introduced Gangjeong outside of Korea in 2009. Choi moved to Gangjeong in 2010 and has been there ever since. Today, almost eight years since the announcement of the base project, the Gangjeong coastline is unrecognizable, carpeted with enormous stacked cement forms of varying shapes and sizes that resemble a giant’s erector set. The 86 species of seaweed and over 500 species of mollusks – once food for the village – have all but perished. The sea is no longer a clear dark blue, but grayish brown. Gargantuan concrete cubes called “caissons,” 10 stories high apiece, sit on the ocean floor where biodiverse coral habitats once thrived. On land, an enormous rebar mold for manufacturing the caissons looms hideously over the horizon. The rumbling and scraping sounds of construction fill the air night and day. The base is slated to start operation in 2015. To add insult to injury, resistance leaders are jailed for months on end, often caught in a revolving door of multiple prison sentences. Currently, three beloved individuals languish unjustly behind bars: 22-year-old Kim Eun-hye, Brother Park Do-hyun, and film critic Yang Yoon-mo, who has been incarcerated for about a year. Depression and suicidal tendencies have skyrocketed in Gangjeong, according to the Jeju media. Women weep in the streets. Often, there are scant visitors to boost morale (and the visitors really do make a positive difference). During the winter when it’s off-season for tourists, they feel alone and helpless against the cranes, dredges and cops of the transnational defense industry’s destructive juggernaut. Someone once asked Gangjeong Mayor Kang Dong-kyun, “What keeps you going?” He said, “Knowing that this is not just for me, not just for my children, or my children’s children, or for my ancestors. It is for world peace.” But Mayor Kang left out a key component as to how the villagers have maintained their resilience for as long as they have: through dance. As silly as it may sound, a series of four wacky dances that celebrate Gangjeong has served as an indispensable catharsis ritual that ends each day. The villagers will also spontaneously break out into the Gangjeong dances when times get tough, such as what happened upon the tearful announcement at the IUCN convention that a resolution to stop base construction had been defeated. It’s how they let off steam so they can keep going. In a certain sense, Gangjeong uses creativity as a weapon in psychic self-defense. Once the villagers mounted a film festival of anti-war videos directly in the gaze of a row of riot cops surrounding the base. It is as if, for every harsh blow, every broken bone, every dead dolphin, every prison sentence, and every fine levied upon them, they emerge with a surprising rejoinder of equal, positive force. Recently they lined the village streets with six-foot high stacks of books, 30,000 in all, creating both political art and a library al fresco — a stunning visual juxtaposition against the squadrons of police. The Gandhi-esque villagers seem to have captured the hearts and imaginations of the world. When a former attorney with the Clinton administration came to Gangjeong, he marveled, “In the face of brutal opposition, they display only grace and persistence.” When a German IUCN bioethicist spent several days in the village, he remarked, “their joy is infectious.” When a Hollywood film director was asked what he liked best about his visit to Gangjeong, he said, “The dancing.” At the core of such astonishing creativity is – again — the community. Perhaps this is the alchemy that can heal all of Korea. One could say that the villagers have metamorphosed Gangjeong into a premiere destination for political tourism. Gangjeong is an excellent place for foreigners starting at a zero knowledge base, to learn about Korea’s place in history and in the region. And the benefits are reciprocal; while visitors learn about Korea, they invariably take their lessons home and spread the information, which, in turn, supports the movement. Professor Rob Fletcher gave a seminar at Costa Rica’s University for Peace on the base struggle. Victoria Tauli-Corpuz, one of the original drafters of the United Nations Declaration on the Rights of Indigenous People, has been in communication with villagers about staking out their identities as indigenous Tamna (which could lead to advantages through processes at the UN). British attorney Harry Jonas wrote a case history of Gangjeong as an example of how legal constructs violate what he calls “natural justice.” Such developments have given new hope to villagers who have lost all faith in their own government. As a result of such exchanges, villagers have become extraordinarily sophisticated about other Asia-Pacific islands also under assault by militarization and the Pentagon’s “Pacific Pivot.” Solidarity has been built with Taiwan, Okinawa, Guam, Hawaii, and elsewhere. Now, when President Park Geun-hye echoes her father’s dream of turning Jeju into “Korea’s Hawaii,” a tourist mecca complete with navy base, the villagers steadfastly oppose. They do not want to see militarization kill all life in their sea, as it did in Pearl Harbor, which is now a toxic Superfund site. Like all indigenous people, they know that without their natural resources, they die — economically, culturally, spiritually. Koohan Paik, who was raised in Korea during the Park Chung-Hee era, is a journalist, media educator, and Campaign Director of the Asia-Pacific program at the International Forum on Globalization. In 2011 and 2013, she helped to organize the Moana Nui conference in Honolulu, which brought together international activists, scholars, politicians and artists to consolidate Asia-Pacific discourse as it relates to geopolitics, resource depletion, human rights and global trade. She is the co-author of “The Superferry Chronicles: Hawaii’s Uprising Against Militarism, Commercialism and the Desecration of the Earth,” and has written on militarism in the Asia-Pacific for The Nation, Progressive, and other publications.